Estate Gold And Diamond Eagle Pin - P3003 at Reliable Gold in Rhode Island Reliable Gold Ltd. 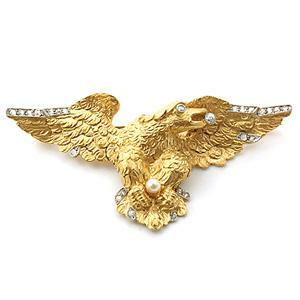 Truly handsome, intricately detailed 18kt yellow gold estate, eagle pin. 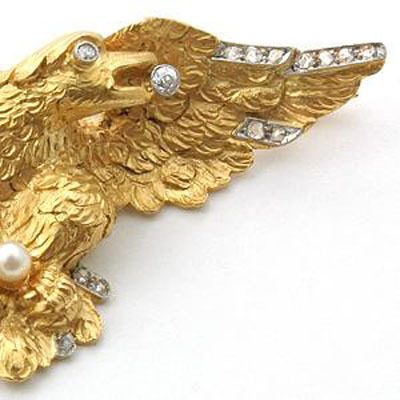 The wings and tail are encrusted with 23 rose cut diamonds total weight appx .35ct. A full cut diamond eye and full cut diamond held in eagles mouth, total weight appx .07ct. The birds talons hold a single pearl.